The Friends Of Kellock Lodge group have started an online petition to keep the heart & soul of Kellock Lodge in Alexandra. 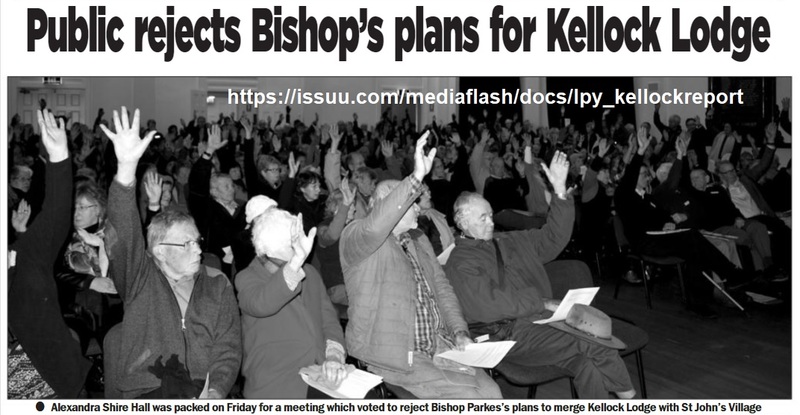 The Anglican Diocese of Wangaratta through Bishop John Parkes is threatening to merge the St. Johns Aged Care facility in Wangaratta with the Kellock Lodge Aged Care facility in Alexandra. Both facilities are on land owned by the diocese however the people of Alexandra state that the establishment of Kellock Lodge was fully funded locally and that in the 30+ years of operation the Wangaratta Diocese has never been called upon to contribute to operational costs. Large numbers of the residents of Alexandra and district believe the proposed merger is simply a means of propping up the facility in Wangaratta.